Guilford Town Hall is located at 31 Park Street, Guilford CT 06437; phone: 203-453-8001. Photo: Comfort Starr House (ca. 1645), 138 State Street, Everett H. Keeler, photographer, 1938, Historic American Buildings Survey [HABS CT-82], memory.loc.gov, accessed January, 2011. First settled 1639, Guilford was named from Guildford parish in Surrey, July, 1643. Indian name, "Menunkatuck." Guilford is situated on Long Island Sound, 16 miles east of New Haven, and 36 miles south of Hartford. The settlement of the town was commenced in 1639, by Mr. Henry Whitefield and congregation. (Mr. Whitefield was a celebrated minister from Oakley, in Surrey, England.) They were a part of Messrs. Eaton and Hopkins' company, and came with them to New Haven, and lived there for more than a year after their arrival. 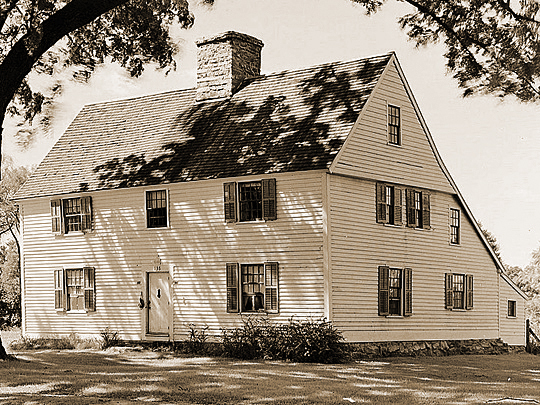 They were present at the agreement at Mr. Newman's barn, and many of them were signers of the articles. On that occasion it was agreed that "The whole lands called Menuncatuck should be purchased for them and their heirs, and that they should settle a plantation there in combination with New Haven." As soon as the first purchase was made, the planters, before winter, removed to New Haven, and settled on their lands; they called the town Guilford. The first record list of names of early planters is found dating a decade later (1650) and includes the following: Henry Whitefield, Samuel Desborough, John Higginson, William Leet, Robert Kitchell, William Crittenden, Thomas Jordan, George Hubbard, John Hoadley, Thomas Jones, William Dudley, Thomas Cook, Henry Kingsnoth, John Stone, William Hall, William Stone, Benjamin Wright, John Johnson, Samuel Blatchley, Stephen Bishop, William Boreman, George Highland, John Parmelin Senior, Thomas Betts, Richard Guttridge, Richard Bristow, John Parmelin Junior, Jasper Stillwell, George Bartlett, John Scranton, John Fowler, Edward Benton, Abraham Cruttenden, John Evarts, John Bishop Senior, Francis Bushnell, Henry Dowd, George Chatfield, John Stephens, John Bishop Junior, John Sheder, Thomas French, Thomas Stephens, and Abraham Cruttenden Junior. It was agreed among the planters "that all and every one should pay his proportionable part or share towards all the charges and expenses for purchasing, settling, surveying, and carrying on the necessary public affairs of the plantation, and that all divisions of the land should be made in exact proportion to the sums they advanced and expedited." The first planters, whether gentlemen or yeomen, were almost all of them husbandmen by profession. There were but few mechanics, and no blacksmith among them, and it was with much trouble and expense that they obtained one. Before they removed to New Haven, they were for some time at a stand whether to settle in Milford or Guilford; but at length they chose the last place mentioned. The Borough of Guilford was incorporated in 1815. It embraced the original settled plat. In 1839 the center was an extensive public square, and consisted of about 150 homes and 2 churches (Episcopal and Congregational). Edward R. Lamberts, History of the Colony of New Haven Before and After the Union with Connecticut, Hitchcock & Stafford, New Haven 1838.